The Bible describes rebellious people as being “stiff-necked.” I don’t know how rebellious I am, but doctors occasionally put me in the stiff-necked category. My first experience with stiff-neck pain was in my college sophomore year, shortly after I’d spent three hours debating theology with a new friend. The problem wasn’t my theological position; the problem was my physical position – stretched out on my side, with my head propped by my palm. The pain came on subtly, but finally incapacitated me during a visit with my West Texas cousins. When I asked for a doctor, my equestrian cousins recommended their chiropractor. I gave a reluctant nod, and my cousins loaded me, ambulancestyle, into a station wagon. Thirty minutes later, I lay face down and shirtless on the doctor’s living room adjustment table. The man placed his fingertips on each quadrant of my back, pondering my pain with a touch much like a wandering kitten. Finally, he started his procedure, pushing, pulling, stretching and thumping on the areas that needed healing. Afterward, I limped toward the “donation” box and placed a twenty inside. I knew something was better because I was upright and ambulatory again. “You will be much better by tomorrow,” he promised. Twenty-four hours later, I sat in class as if my injury never happened. Nowadays, I still have sporadic problems, but thanks to the blind chiropractor, I’ve been able to trust my issues to other chiropractors – with one exception. Eight years ago, I was referred to a local chiropractor for preventive management. I was greeted by his attractive staff and spent my hour-long wait staring at his fish aquarium. After he took x-rays, he announced his prognosis with the tone of someone talking to a terminal patient. He told me I was falling apart, but if I’d consent to immediate treatment, he could reverse my early demise. The entire process would take the better part of a year, and much like the arrangement with my daughter’s orthodontist, I could pay in monthly installments with a small financing fee. The difference between this chiropractor and the blind chiropractor is a case study in the different ways we often express concern for those we love. My first doctor did something my charismatic friends describe as “speaking healing into my life.” He told me I would get better and I did. On the other hand, the second doctor spoke pessimism, gloom and hopelessness into my life. Unfortunately, it’s too easy to act in the same manner as the 90-days-same-as-cash doctor. It’s tempting to speak to people in that know-it-all, manspeak, tone that will discourage friends and family trying to accomplish their dreams. I consider myself fortunate to have friends who told me I could and I did. Not long after the discouraging rant from that second doctor, I ran several half marathons and two full (26-mile) marathons. Fortunately, I also found a new doctor. He’s much like the first one. 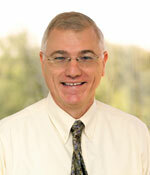 He’s a man of faith who, in turn, expresses that faith toward his patients. And that, my friend, will always be the best healing prescription for this stubborn and sometimes stiff-necked chaplain. 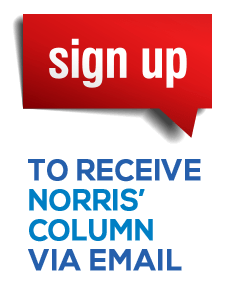 – Write Norris at comment@ thechaplain.net or P.O. Box 247, Elk Grove, CA 95759. Twitter @ chaplain, or call (843) 608-9715.